‘Radhe Radhe’ – the guard while opening the door for you greets you with a delightful smile on his face. You step inside Nidhivan Sarovar Portico and you realize that you have been transported to a world of devotion and sanctity. The many manifestations of the Lord Krishna in the form of beautiful paintings, plush interiors and embellishments will constantly remind you that you have indeed set foot in His abode, Vrindavan. 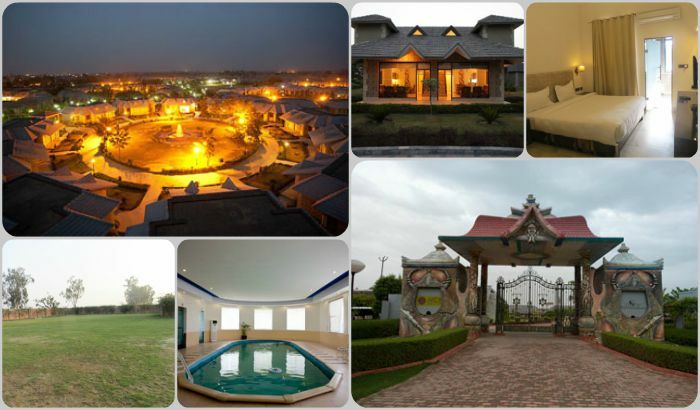 A 4 years old property, the hotel is located at Gopalgarh-Tehra Road in Vrindavan. The famous Prem Mandir and The ISKCON Mandir are just 3 kms drive from here, while the Banke Bihari Mandir is situated at a distance of 6 kms from the hotel. The hotel has 68 rooms in total. Though at present they have just 1 category – Deluxe Rooms, the hotel is in the process of getting extended and will soon come up with 34 more rooms that will also include suites. It will then have 98 rooms and 4 suites and will be ready by November. 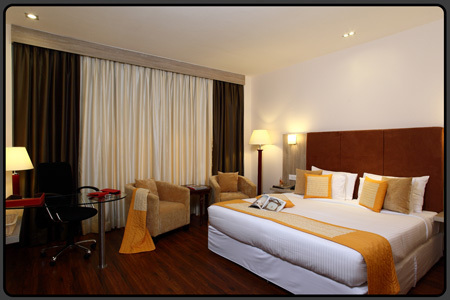 The need for Suites are specially felt during weddings which otherwise are not much in demand here. 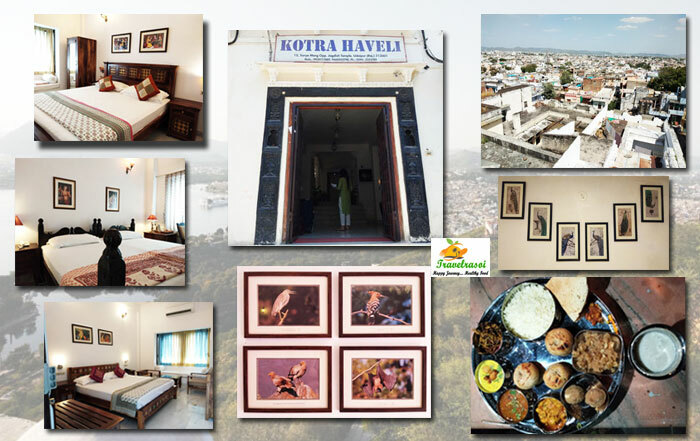 The hotel also organizes lot of festivals all around the year that happens to correspond with some of the important events or festivals celebrated in Vrindavan. 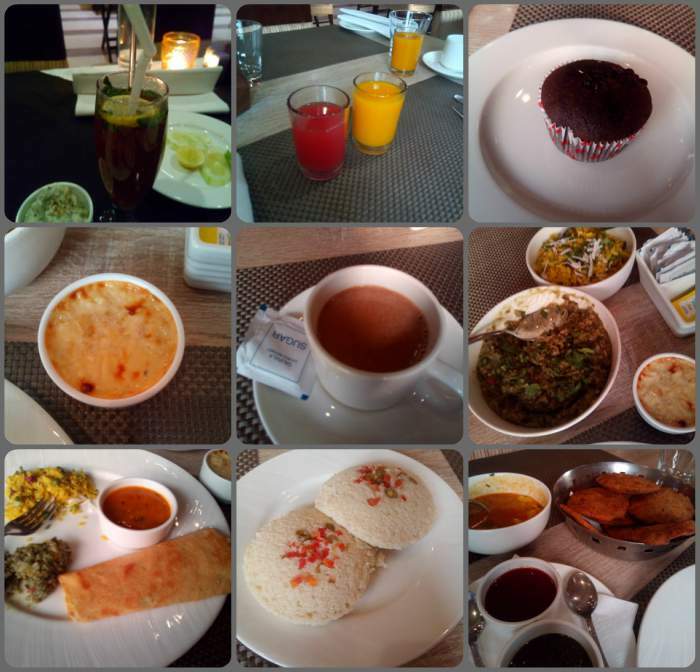 Tripti is the fine dining restaurant at Nidhivan Sarovar Portico that excels in serving pure vegetarian food of excellent quality to it guests. What is unique about its food is that in none of its preparations would one find onion or garlic, and yet it tastes so delicious. Lunch is very special at Tripti, more so because they serve a Sattvik Thali that in all aspects clearly fulfils the requirements of a pure Sattvik meal. We started with Buttermilk and then came the Sattvik Thali, a wholesome meal that consisted of rice, tawa roti, kaali mixed daal, Bhindi mixed with sprouts, chene (paneer) ki sabji, aloo ki sabji, lauki ke kofte and lastly gulab jamun. As because it was prepared in less oil and had balanced spices, the meal was felt to be quite light and very satisfying. 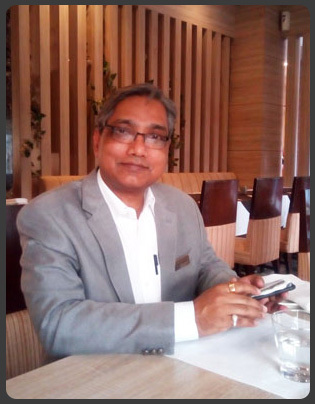 Ratnesh, who has a good knowledge of culinary trends based on his worldwide experience, provided us a detailed perspective on the Sattvik Thali the hotel offers. “Taking guidance from the Bhagvad Gita, we realized that we should introduce Sattvik food. There are clear verses in Gita (Chapter 17) that mentions of Sattvik Food. When we say Sattvik, we talk about something that has ‘Prana’ (soul) into it, something that brings vitality, purity in a person and is made with love and we have adopted this in our food culture. We use in our food whatever is in and around us – fresh fruits, leaves, vegetables. We do local procurement of the vegetables and fruits. 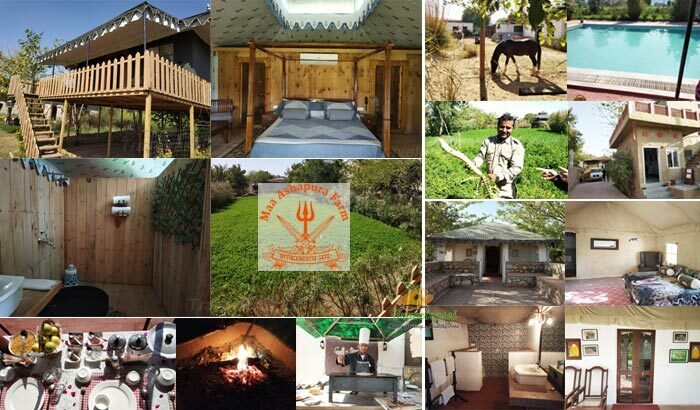 A lot of guests who come to stay with us like the experience of being here and having something so pure and fresh. We treat every food as a piece of art, where heart and soul go into it. Every food has a historical background and we have tried to reinvent those things in the food that we prepare here,” he explained. For dinner we had Italian Minestrone Soup and frankies and paneer shashlik as starters. In the main course we were served paneer darbari, govind gatta curry (the only curry that had onion & garlic), stir fried veg, dal makhani, jeera rice and assorted bread (tawa roti & tandoori roti). 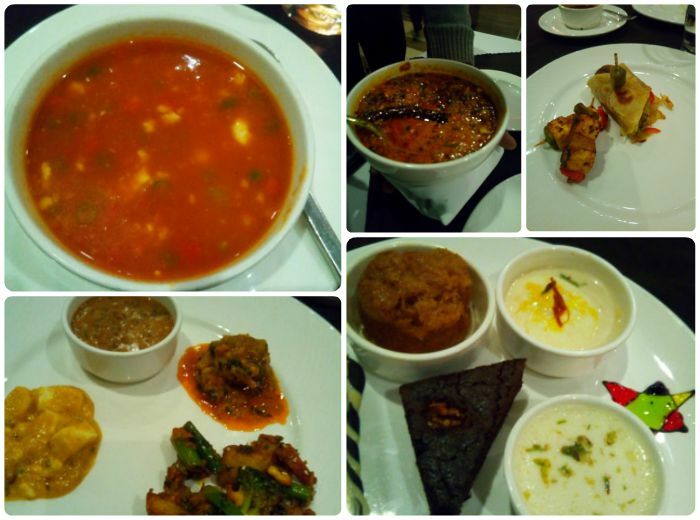 For desserts, there was balushahi, rasmalai, baked yoghurt and chocolate brownie. Our breakfast at Tripti started off with fresh water melon juice, canned mango juice, strawberry milkshake, butter milk and fresh cut fruit. For main course, we had porridge, moong dal chilla, poha, idli with sambhar, aloo paratha, and baked boondi for dessert. The chef was also kind enough to specially treat us with bedmi poori with aloo bhaji (sabji), a breakfast that happens to be very popular in Vrindavan and Mathura. Bedmi pooris are made by mixing urad dal with whole wheat flour (aata) and semolina (suji). Though did not get the opportunity this time, but we would surely love to visit this place to experience its vegetarian Chinese and South Indian food that I heard are equally good. 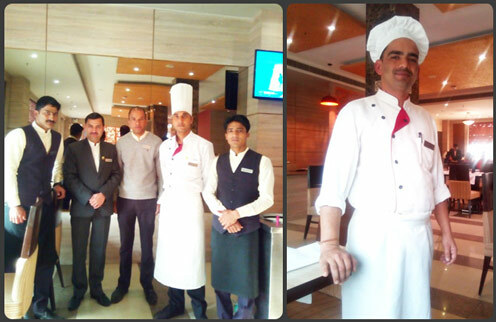 A special mention also needs to be made of the F&B staff of the hotel who was very friendly and cordial. The hospitality and the eagerness shown on their part left us feeling very special. 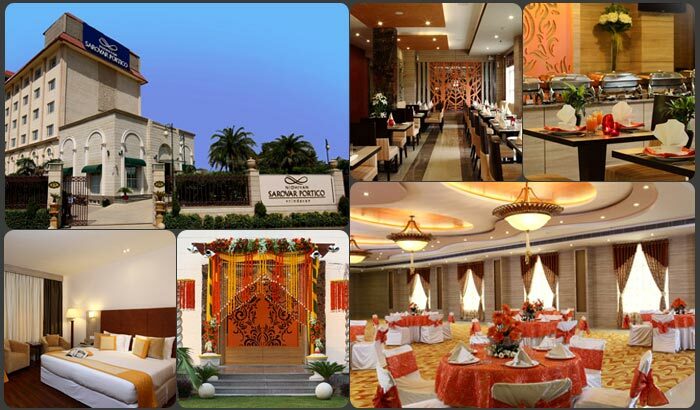 Nidhivan Sarovar Portico is also well known as a preferred venue for destination wedding. The place has had in the past organized some very lavish and prime weddings. Right from ideating on a wedding theme to planning, designing and implementing the same, the hotel takes pride in organizing the best weddings in Vrindavan. 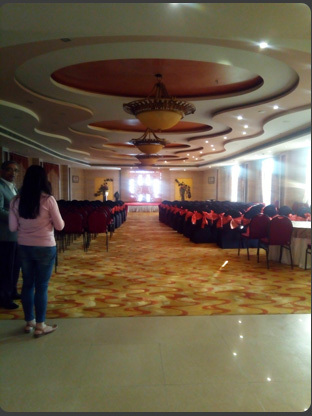 The hotel has a banquet hall that has a capacity for 200 people. 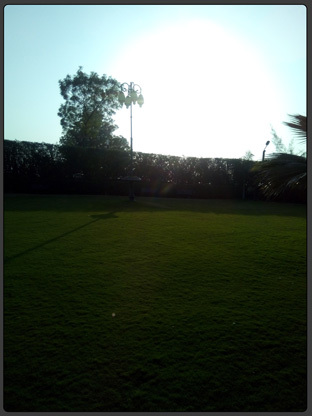 There is also a party lawn used for the purpose of wedding which is also getting further extended. The new lawn when ready will be able to accommodate close to 1000 people. 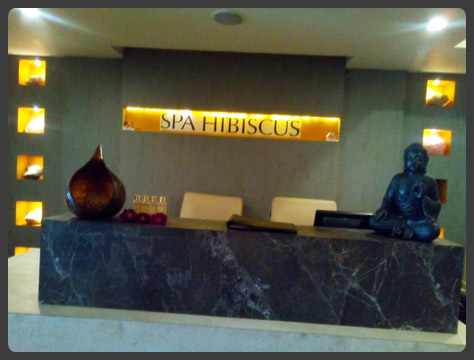 For guests who seek for recreation and fitness, the Hotel also has a Spa – Hibiscus that has been outsourced and a gym. The spa has 2 therapy rooms and 2 therapists. There is also a Souvenir shop at the lobby level adjacent to the restaurant. The library at the lobby has a good collection of books on Lord Krishna that can make for an interesting read. You wake up to the sound of conch bells and the ringing of temple bells in the vicinity, you draw the window drapes and the pleasing sight of lush green fields meet your eyes, you go down for your breakfast and you are greeted with ‘Radhe Radhe’, you start the first meal of your day with food that delights your soul and mind – you experience so much and more of these while at Nidhivan Sarovar Portico. Share the post "Discover the Spirituality in you at Nidhivan Sarovar Portico"